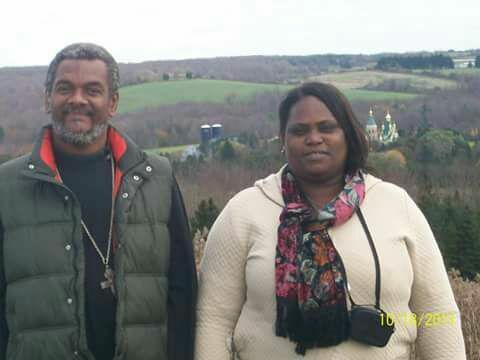 Matushka Rose with her husband Fr Gregoire Legoute (2010) in Jordanville, NY. "We are continuing to live in an extremely difficult conditions, the rainy season has caused many more health problems : epidemics, fever, and the flu have spread across the country. The rivers have overflown and often it is impossible to reach where you need to go ; armed gangs continue to terrorize Port-au-Prince and other cities. A magnitude 5.9 earthquake has done a lot of damage in the far north of the country, more than 20 people are dead and dozens wounded, many houses have collapsed. Thank God, our parishioners in the north and the central plateau were not directly affected. Give now to help Matushka Rose - a widow with two children! Experts are saying that the risk for another major earthquake in Haiti is high; they are also saying there is danger of a tsunami. The people of Haiti are advised to stay vigilant. Meanwhile, those who suffered from the earthquake in the North of Haiti are pleading the government to send them support so they can take up their lives again. Since Monday last my health has suffered greatly. I was returning home after picking up my children from school. We were stuck (on a bus) in monstrous traffic under torrential rain when we were accosted by an armed gang who started shooting in different directions. We lived a moment of true terror, which adversely affected my health. When we finally arrived home, I had a splitting headache, and I started having visual disturbances. I took all my medications, and spent the night without sleep, monitoring my blood pressure and sugar, which were very high. According to my doctor, I almost had a stroke. Now I have to undergo several medical tests. I have been prescribed different medication and sedatives. I still suffer from headaches. I ask for your prayers for Haiti, for my family and for myself.